A tumultuous past and a challenging present collide to make Havana one of the most gloriously contradictory cities in the world. Add the buzz and energy of the Cuban capital and stir in the sights and sounds of a city that for so long had little outside intervention, and you have a place that offers the visitor a rare magic. Havana is much more than a time capsule. You’ll see the classic cars clanking along cobbled streets, and the once majestic but now crumbling colonial architecture, but then your gaze will flit to the beautifully restored buildings standing alongside in perfect disharmony. Not surprisingly, Havana is the most international city in Cuba, the most exposed to tourism and the most modern, but it is still full of history – and life. It must be seen and experienced to be believed. Havana’s richness and diversity demands more than a day. In fact you could easily spend a week here and barely scratch the surface. Follow the trail of narrow cobbled streets and admire the colourful colonial architecture in Old Havana. Admire the historic plazas along the way and take a minute to absorb their beauty. Hop from Plaza de Armas to Plaza Vieja (the largest and most picturesque square) to Plaza de la Catedral where, beyond the church itself, you'll find elements of Afro-Cuban heritage in the shape of colourfully dressed ladies, eager to read your fortune after a throw of cards. 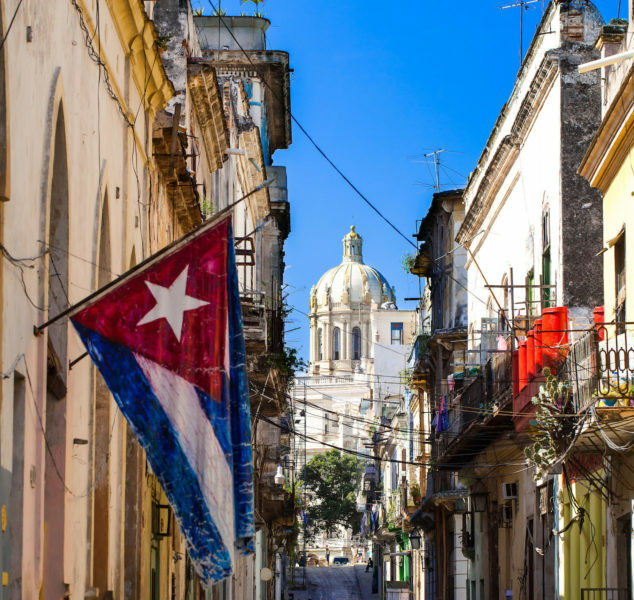 Walk down Obispo Street in Old Havana, lose yourself among the flurry of shoppers, and get a real feel for the daily life of habaneros in this part of the city. This long and bustling pedestrian street is packed with stores of all kinds, and restaurants. This is a great place for people-watching and immersing yourself in the dynamics of local life. While in Old Havana, take a minute or two to admire El Capitolio, a replica of the Capitol Building in Washington, housing the Statue of the Republic, world’s third largest indoor sculpture. While away a few evening hours on El Malecon, one of downtown Havana’s most popular gathering places and recreational hotspots. This panoramic esplanade and seawall runs along the city’s coast for eight kilometres, with plenty of sights to take in along the way. At night it comes alive with the sound of impromptu troubadours. Get a feel for Castro's Cuba at Revolution Square. No other place in Cuba is quite as evocative of the Cuban revolution as this wide space, crowned by a star-shaped tower and the vast sculpture of independence hero, Jose Marti. Few can resist taking a picture against the colossal image of Che Guevara captioned by his famous phrase “Hasta la victoria siempre” (“Onwards to victory always”). Get down for a steamy rumba session with the locals at Callejon de Hamel, a spot famous for its live music sessions on Sundays and a folkloric ambience any day of the week. Meet young entrepreneurs in the Barber Shop’s alleyway (Callejón de los Peluqueros) in the atmospheric Barrio del Santo Angel (also known as Loma del Angel), a charming little neighbourhood that inspired Cecilia Valdes, one of the classic Cuban novels. Explore Ernest Hemingway's Havana at his former home in Finca Vigia, maintained in its original state with his personal objects, hunting trophies, manuscripts and other memorabilia. Outside you’ll be able to gaze at the pool where Ava Gardner once reportedly swam naked. Speaking of Hemingway, don’t skip La Bodeguita del Medio, the birthplace of the mojito, or El Floridita, where you can order Hemingway’s special (double rum, no sugar). A life-size statue of the old man props up the bar, smiling knowingly. Book yourself in for a performance of the Buena Vista Social Club. Most of the original members may no longer be with us but you’ll be treated to the band’s classics all the same. Founded in 1515, Havana is Cuba’s largest city by area and by population, with 2.1 million inhabitants. During the first half of the 20th century, Havana became the hedonistic capital of the Americas with booming casinos and nightclubs that dwarfed even those of Las Vegas. The party came to an end in 1959 when Fidel Castro’s communist government seized all private property to fund its programme of health, education, housing and social reform. There’s much more to Cuban music than salsa. Cubans traditionally prefer the more free-flowing casino and most so-called salsa bands actually play timba, a salsa subgenre. Cuba was also the birthplace of mambo, son, danzón, guagancó and cha-cha-cha, so there’s plenty to get acquainted with! If you’re based in Old Havana, Centro Habana or El Vedado you’ll be able to access much of the city on foot. The state-owned yellow cabs are modern and air-conditioned, and can be flagged down in the street. If you want to be adventurous and rub shoulders with habaneros watch out for the shabbier looking classic cars with a Taxi sign at the front – these offer cheaper rides for locals, charging 20 Cuban pesos (a little less than a US dollar). They operate fixed routes, more like minibuses, so a little Spanish would be useful to establish where they’re headed.